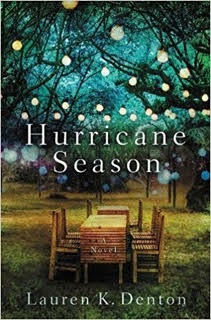 Review: Hurricane Season is really a beautiful book and that's not just the cover, I'm talking about. Its a book about two sisters that are very different. Jenna was a wild child, now a single mom and Betsy is a farmer's wife, and the more stable of the two. Each are in very different parts of their lives. The sister scenario is something I'm seeing a lot of lately in books, especially with sisters that are polar opposites. Neither are exceptionally likable. They are both very human and the reader should feel a certain amount of pity for each of them. Jenna, because her life is not very put together, but she is trying, while having two small daughters to take care of and it seems her dreams of being a photographer are slipping away. Betsy is the stable one, trying desperately to have a child with her husband, Ty. Because of a photography camp, she finds herself with her sister's kids for the summer. This is both a joy and a trial for her. I loved experiencing both women as they grow through those months, whether that growth be for career or family. By the end of the book, you will find yourself really caring for both women and their families. I especially loved Ty, Betsy's husband, but its the children in this book that steal the show and are the reason the adults all become better people. Addie and Walsh were perfectly quirky kids. (I would have loved to have a story behind that child's name). The ending was bittersweet. It wraps things up but leaves things open at the same time. Part of me wants Ms. Denton to revisit these characters somewhere down the line, because I want to know what happens to them. Will Jenna and Sam finally try a relationship? Will she succeed with her photography? Will Betsy and Ty become blessed with a child of their own?